From July 9-11, hundreds of folk artists from 52 countries will gather at the Santa Fe International Folk Art Market to showcase and sell their special crafts. How precious is something that is learned from one’s ancestors and unique and beautiful in the modern world! Jessica Winter’s article in “O – The Oprah Magazine” this month captures the flavor of what is to come at the Art Market. We also look forward to Hand/Eye magazine’s reports from on-site. I received good news that Farah Ghuznavi – with whom I worked at the United Nations Development Programme in Bangladesh – has just released a short story in Woman’s Work, a diverse collection of short stories by forty women writers that promises to be an interesting read. Early in my time in Bangladesh, Farah introduced me to her mother, Ruby, from whom I have learned so much about textiles, natural dyes and craft. Ruby and her team at Aranya Crafts have worked steadily to preserve and promote the rich cultural and artistic heritage of the region and, in the process, have touched the lives of thousands of people. During our recent film shoot in Dhaka, we interviewed Ruby about nakshi kantha embroidery and Surayia’s role in its evolution. Anil Advani, who has been helping us so much in photographing Surayia’s work in Bangladesh, recently joined Surayia and others at the US Embassy in Dhaka to document the two nakshi kantha tapestries that Surayia completed about twenty years ago for the US Embassy building in Bangladesh which opened in 1989. One of these tapestries is a “one of a kind” piece, designed by Surayia after she had witnessed the cutting of the ribbon at the Embassy inauguration ceremony. The other is a series of 9 panels based on designs of architect Louis Sullivan. Surayia recollects that the designs were sent to her as small photocopies. She chose the threads and supervised “her girls” to embroider them for the Embassy opening. 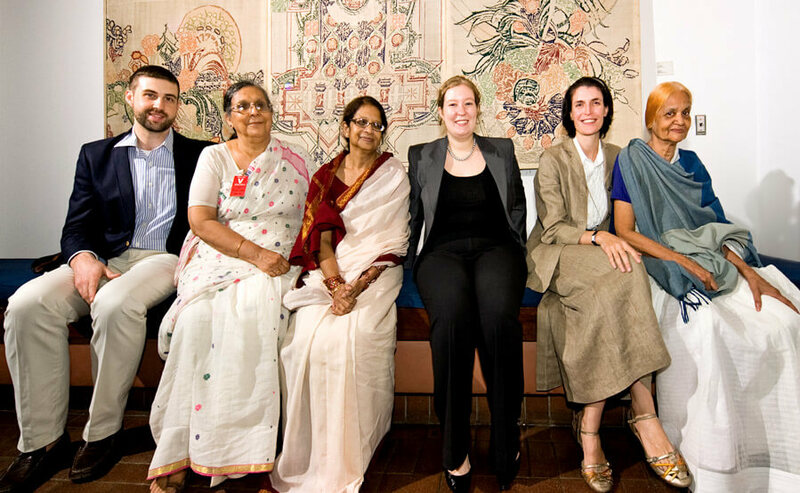 Many thanks to the US Embassy for preserving these special kantha tapestries! I recently spoke with Dr. Niaz Zaman of Bangladesh, one of the world’s foremost experts on kantha embroidery who we interviewed for “Threads” during a film shoot in Dhaka in April. She will be giving a special lecture about the evolution of kantha on Sunday, June 13, at the Philadelphia Museum of Art: The Kantha: From Bedroom to Boardroom. Dr. Zaman was with Surayia not long ago at the US Embassy in Dhaka where Surayia’s work was being photographed. More about that in our next post. 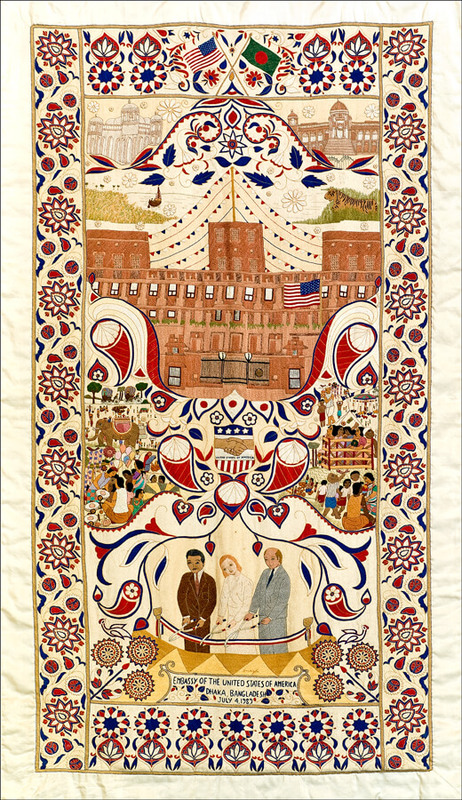 Also…..while at the Philadelphia Museum of Art, don’t miss the exhibition “Kantha” which runs through next month. Len and I visited the exhibition earlier this year and highly recommend seeing the almost forty kanthas collected by Stella Kramrisch and by Jill and Sheldon Bonovitz. Photographs used with the kind permission of Surayia’s friend in Italy. Click the pictures for a large view. Surayia Rahman, a self-taught artist in Bangladesh, painted and designed hundreds of tapestries that are now appreciated around the world. 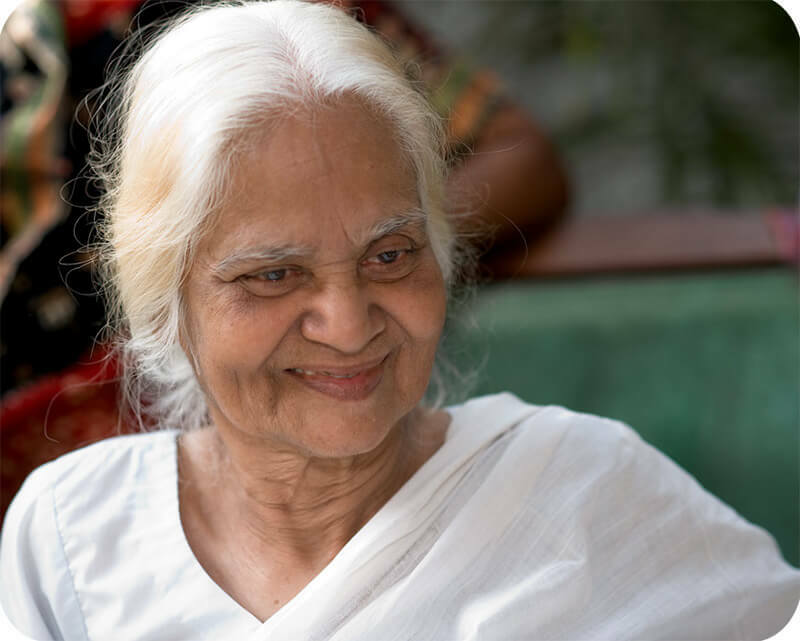 She is a mother herself, and also nurtured hundreds of young women in Bangladesh as she guided them to produce incredible embroidered tapestries. Though these women were very poor, their talents and new skills helped them to feed their families, send their children to school and university, rent a home or own a piece of land. They came to her, over roads and over rivers, for inspiration, for guidance, for work. She is Surayia Rahman, a self-trained, passionate artist who guided hundreds of women from disadvantaged backgrounds to create masterworks – exquisitely embroidered tapestries that have been gifted to dignitaries and are admired in collections throughout the world.